YouCantMissThis.com- By Bones Rodriguez: AMAZING AFFIRMATIONS! The Affirmations Workbook That You LOVE Writing In Everyday! AMAZING AFFIRMATIONS! The Affirmations Workbook That You LOVE Writing In Everyday! This blog post is for you. This is the only one that makes any real difference. Addicted to some behavior you don't want anymore? You're an actor, and you think enough applause will make the difference? Worse than that, you probably hate yourself on some level for some reason. You like other people, even love other people. Despite the common misconception that you have to love yourself before you can love another, I'm sure you DO love other people. And you're a lot nicer to them than you are to yourself, because for one reason or another, you don' think you deserve it. All this means is that you would be better off if you loved yourself. But to actually work to love yourself, and believe it, you need to be BRAINWASHED. You need to brainwash yourself into loving yourself. Or, if that's not good enough reason for you yet, do it for the people you love who love you- even though you don't deserve their love. In fact- if you WANT to deserve their love, then go ahead and love yourself for THEIR sake. At least until you are done brainwashing yourself. 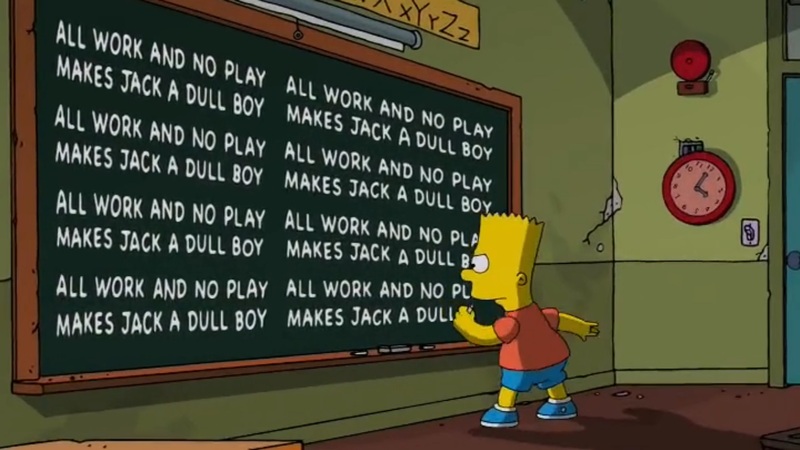 One day, while watching THE SIMPSONS, I saw Bart Simpson writing on the chalkboard, just like the beginning of every episode. But this time, it hit me! I should be WRITING out my ONE single affirmation over and over until it is cemented in my brain. Don't I need to meditate, and "reach my inner child", and "leave those conversations behind", and walk through fire, and dance and sing and shout? Maybe, but that's not what this is. This is ONE simple, ROTE method for changing the ONE belief that makes any damn difference. 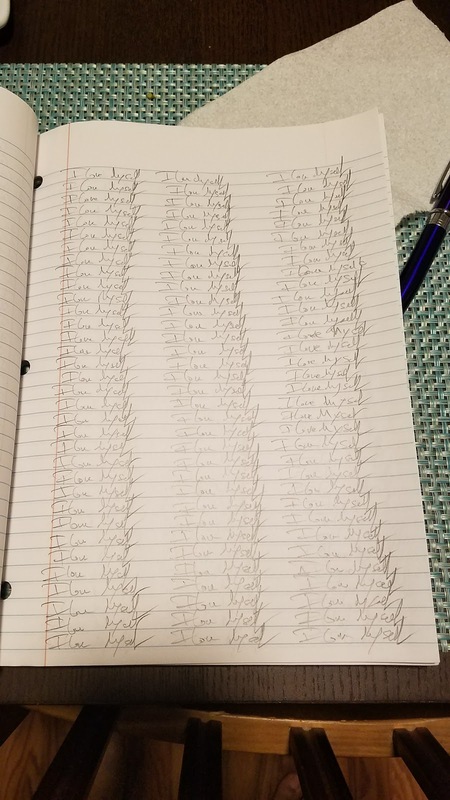 Then turn to page 1, and write "I love myself" in three columns, down the page, about 100 times. Just sit there, and write it. You may want to say it aloud as you write it, you may want to sing it. That's fine too. If you had a third hand, you could tap your meridian points too. I have no fancy words for it other than to tell you that it's the simplest, easiest, way I have ever seen to get some amazing results. But they all say that, right? No unconscious audios, no communing with spirit, just ROTE, MECHANICAL actions. Not sure? Then your first 100 writings will be "I Can Do This". At first, it was weird. Then it was fun, and novel. And now I look forward to it. Not 5, not 10, but about 7 minutes. You can take your time, or you can rush. If you miss a day, you just pick up where ou left off. No "makeups" unless you want to punish yourself. But someone who loves themselves wouldn't punish themselves over something so dumb as writing "I love myself" in a book over and over. Besides, is that a punishment? It's a statement of fact. Because it's the Affirmation Workbook You LOVE To Write In Everyday! Let me know how you like it! Post pictures, videos, whatever!